How to redirect posts & pages in WordPress? In order to avoid error pages or duplicate content, for example, it is particularly important for you to redirect your WordPress posts and pages. Since WordPress does not offer a function for redirecting single posts and pages, you are going to need an extra plugin for this. With our WordPress plugin BAVOKO SEO Tools it only takes a few clicks for you to redirect your WordPress pages via 301 and also to take over their link juice. Thanks to the automatic redirects that are possible with BAVOKO SEO Tools, you can even set up automatic redirects for your WordPress posts and pages after slug changes or 404 errors. Click on the “Redirect Manager” button in the Tools section. In the upper part, right under “Add custom redirect”, you can select whether you want to redirect an exact URL or complete directories. For redirecting single WordPress posts or pages, select “exact match”. Now enter the respective URLs in “Redirect from” and “Redirect To”. Under “Add redirect”, select whether you want to redirect the URL via 301 or 302. Lastly, confirm your entry and set up the desired WordPress post or page redirect(s) with a click on “Add Redirect”. 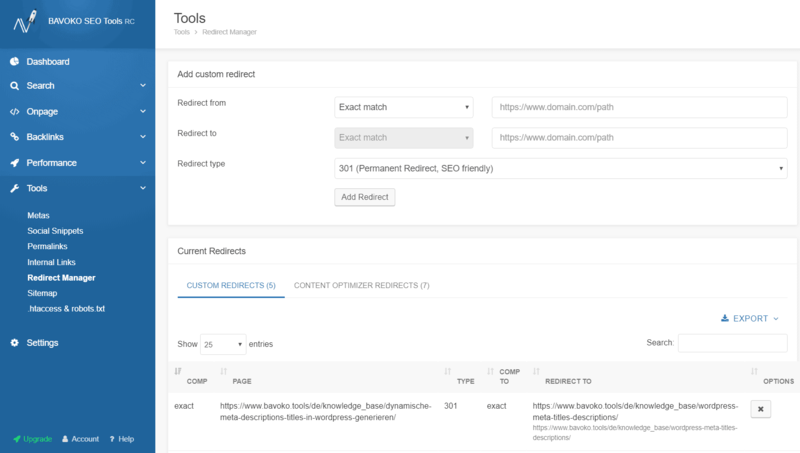 In addition to redirecting single WordPress posts and pages using the “exact match” method, the BAVOKO SEO Tools Redirect Manager also allows you to easily redirect complete directories using the “contains” function. You will also find the WordPress post and page redirects you have already created within a clear overview below in the plugin. Search engine-friendly redirect. The search engine is informed, that your page has been moved permanently. The page’s link juice will also be transferred. The redirect is not permanent, for example during maintenance work on a page. The link juice will not be transferred. Navigate to the tab “Advanced” in the Content Optimizer. Next to “Redirect To” you will find a checkbox in the upper area with which you can activate a redirect for this page. Now add the new URL from the page to which the WordPress redirect should lead. Using the dropdown menu, you can now specify whether you want to redirect the page via 301 or 302. BAVOKO SEO Tools will then automatically save and apply your settings. Thanks to the intelligent plugin architecture, the useful Content Optimizer in BAVOKO SEO Tools can also be accessed at any time during the analysis of your pages. This enables you to set new 301 redirects for your WordPress pages already during the analysis. As on your posts and pages, you will find all the necessary redirect options in the “Advanced” tab. BAVOKO SEO Tools not only allows you to manually redirect single WordPress posts and pages, but also to activate automatic redirects for certain events. Pages, on which a change of the URL Slugs was made, are thereby automatically redirected to the new URL in a search engine-friendly way. Within the tab “Redirects” in the Tools section of our plugin, you can also activate the function “404 to 301”. All 404 error pages that appear on your website will then be automatically redirected via 301. At several cleverly selected points, you can use our plugin BAVOKO SEO Tools to set up search engine-friendly 301 redirects as well as temporary 302 redirects for WordPress posts, pages or entire directories. In this way you can very easily avoid error pages and effectively prevent a drop in your SEO rankings. In our Knowledge Base we have covered the complete topic “Redirects in BAVOKO SEO Tools” in detail. So if you want to learn more about search engine-friendly redirects and the additional options in our plugin, you can read on here.